To win the game of roulette the player is supposed to predict the winning number and to make his or her bet accordingly. The whole game itself is based primarily on luck, but some players choose different strategies like figuring out 'hot' numbers or simply betting on their favorite numbers or dates of their birth. Others even use certain systems, trying to figure out the winning combinations mathematically. The players can also bet on a group of numbers to secure themselves, but in this case the amount of money they may win will be less. The most risky bets, like those on one number, pay the most. Anyway, it is deemed impossible to beat the casino in a game created primarily to bring profit to a house. The roulette wheel has 37 (in European roulette and French roulette) or 38 (in the American variant of the game) different color pockets. Black and red pockets represent 36 odd and even numbers in both variants of the game, and green ones stand for zero. The main difference is that the wheel in European roulette has one zero while in American roulette there are two zeros slots -single zero ('0') and double zero ('00'.) This makes European variant easier to win as the house edge in the game with one zero is only 2.7%, while in American roulette it makes 5.26%. House edge is the advantage of the casino over the players securing its profit. 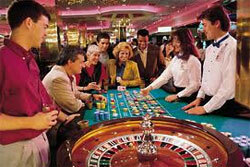 Let us see how the roulette casino game proceeds. The players make their bets by placing different color chips on certain numbers on the table layout. The chips are bought from the croupier. Each player chooses chips of different color so that the bets of different players are not mixed up. After the winning number is announced, the winners can exchange their chips for cash chips with the exact value printed on them, and these chips are in their turn exchanged for actual money. When the bets are made, the croupier spins the wheel and launches the ball onto the track on the wheel. As soon as the ball is ready to fall into one of the pockets, the croupier announces that no new bets can be made or no bets can be changed. The croupier puts the marker (dolly) on the winning number, then sweeps away the bets that have lost and distributes payments. Winners can change their cash chips for actual money. Only when the table is clear, the players can make new bets. 'Inside' bets, as was mentioned above, pay more. For example, single number bet pays 35 to 1 (although actually it means 36 to 1), while 'outside' bets, like ones on the outside row, pay 2 to 1 or even 1 to 1 as in the case with bets on red or black. Outside bets on red or black or odd or even pay 1 to 1.